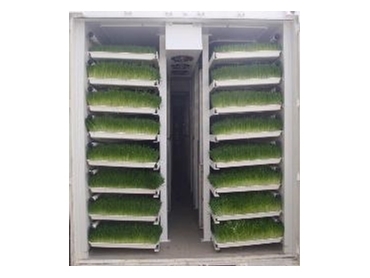 Global Fodder Solutions (GFS) specialise in the design, manufacture and retail of hydroponic growing systems including, containerised fodder modules. The GFS patented systems are environmentally responsible and recycle up to 70% of the water used. GFS can cater for fodder production rates of 140kg/day in the GFS Mini Module, right up to 500t/day in their Biomass Factories. Fodder crops grown in GFS modules develop from seed to harvestable sprouts in seven days. The fresh fodder is highly nutritious and able to be grown all year round, regardless of outside climatic conditions. GFS also have a range of fully self contained mushroom growing modules and mushroom factories suitable for private, small business or large commercial operations.